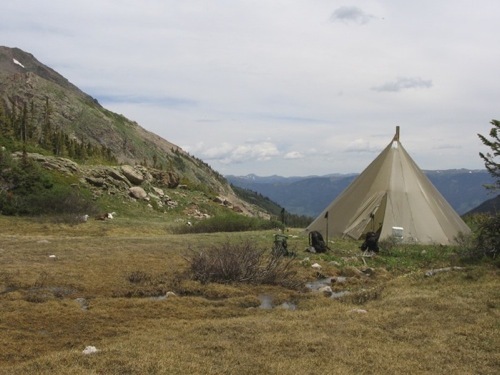 Summit Pack Goat tried on a different elk hunt in 2010. Fortunate to draw some prized New Mexico Elk Permits, not a goat trip, but a great elk hunt it was. Ryan supplied some "Goat" action, while Dan had some great hunts too. Ryan and his Boys get another bull!! 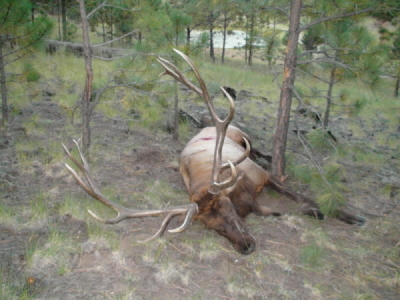 Ryan's elk hunt lasted a whole five minutes on opening day.......that's a quickie!!! For the first time in over a decade, our fall elk hunt did not have the goats along, different type of hunt, to say the least. For over a decade we have gone through the motions, completing our New Mexico elk applications in timely fashion, wait until June to learn our usual fate, then plan our OTC Colorado elk hunt. Pretty simple routine and we've spent enough time in parts of Colorado to bring home an elk on a fairly consistent basis. 2010 was proceeding in our normal pattern, Hilg completed the online application, I attached on to it, and we wait. The first week of June I can be found around Lake Mille Lacs, Minnesota. Unwinding after a day on the water, I notice the red flashing on my phone alerting me of an awaiting message. Email from the New Mexico Game and Fish, congratulations on your successful draw. A quick call to Hilg surprised him with the news, he checked our application, sure enough, we were going to see the Gila National Forest in New Mexico, got our first choice. 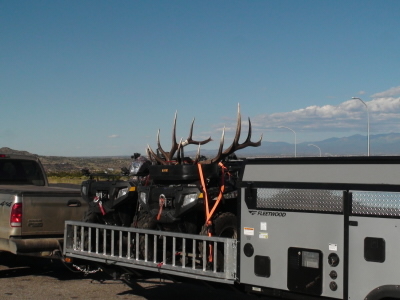 We have never stepped a foot in New Mexico and now had three months to plan our hunt. Research started with internet searches, asking for help on forums and talking to friends that have hunted down there. Maps of the unit were ordered and the notes and suggestions began to make some sense. 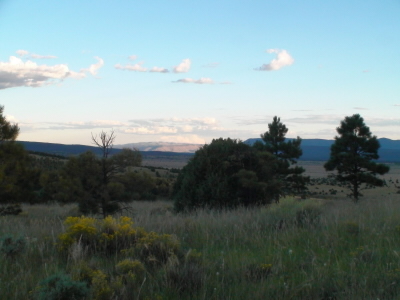 The names of peaks, mesa, tanks and creeks became common vocabulary, and conversations with game wardens and biologists confirmed and clarified much of the information we gathered. We wanted to avoid as much hunting pressure as possible and eliminated some areas frequently mentioned in public forums. 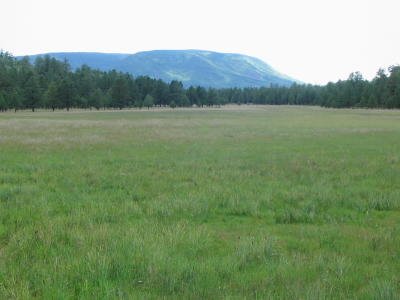 Plenty of elk to hunt, just need to find a place that fits our style of hunting. 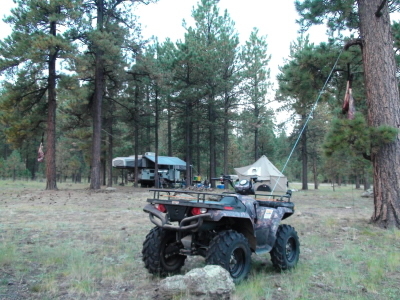 Far from the wilderness hunts we have done in Colorado, we packed up a camper with plenty of food, drink and two 4-wheelers. We were also joined by our elk hunting mentor, Monte, who has spent a lot of days in the field teaching us much about pursuing elk. All packed up, we pulled out from Hilg's house early Monday morning, September 13th. 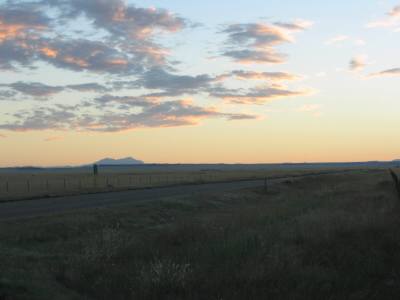 It's a long drive to New Mexico and at the end of the first day, we saw sunset on the SE plains of Colorado. We got some sleep in Sante Fe, NM and were back on the road early in the morning. The Interstate travel ended at Socorro and we began to see some roads less traveled. Lots of antelope inhabitated areas near the highway and we also saw efforts to locate some beings inhabiting places well away from earth. By late morning we had arrived at Reserve, NM. Lunch at Carmen's was a treat and became a regular stop when we made it to town. Reserve, NM is probably a pretty quiet town outside of elk seasons, far from it's busy days in the 1940's and 50's when the logging industry thrived in the area. The history of logging provides an extensive road network and an open forest with very little dead fall. 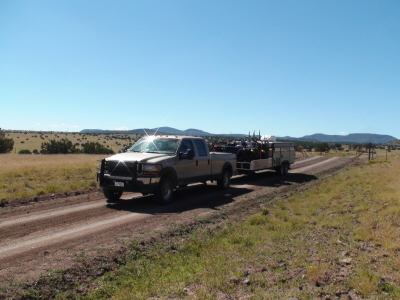 Access to most areas is pretty simple with a truck or 4-wheeler. With our water and ice supply topped off, we made our way to our first camp. 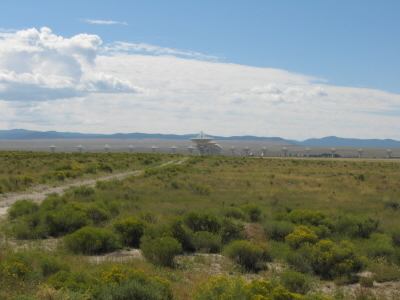 Camp was located on some open country below a large mesa. Cedars and Juniper dominated the landscape, hot during the day, and man made tanks provided the water needed for the elk. The drive into the area provided early evidence of bulls in the area, trees and bushes shredded by the thrashing antlers. With the trailer parked, we made an evening scouting run on the 4-wheelers to a lookout picked out long before we had left Nebraska. Rubs, tracks, and droppings along the road were common and the view from the lookout provided the first elk sighting of the trip. Elk were filtering down from the surrounding hills and bugles began to fill the night air. Back at camp, the bugles continued throughout the night. We split up in the morning, Monte and I took a walk above camp. Lots of rubs, tracks, and a few bugles encouraged us. We checked out a tank that was being used and picked out a nice lookout spot for the evening. Hilg had a similar morning and met another hunter, Jim, as he was heading back to camp. Jim had just killed a bull and we volunteered to help him pack the bull out. Jim got his bull just a few hundred yards from where a friend of mine had similar success in years past. It was nice to learn the elk patterns were similar. With Jim's bull boned out, we packed him out in one trip and got him to the coolers. 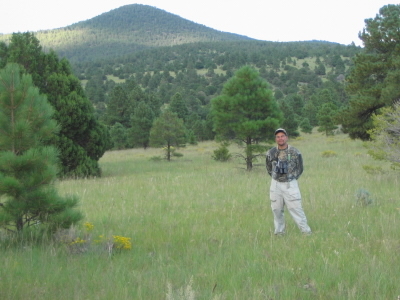 Jim had been hunting hard for six days, seeing plenty of elk, but not any of the big bulls we were looking for. Our evening scout provided more bugles, but we decided Thursday would be a scouting day in another area. Breakfast at Carmen's, then off we went to some new country, too �new.� Bad directions from a construction worker got us 30 miles down the wrong road. As we stopped on a turnout, map spread across the hood of the truck, a New Mexico truck stops. The husband and wife get out of the truck and introduce themselves as the off-duty game warden and biologist for the area, both originally from Nebraska. Not only did they get us going the right direction, they pointed out a couple areas worth our attention. We made plans to watch the Nebraska Football game together on Saturday, and we were off. 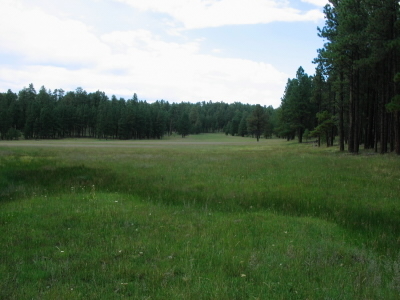 The landscape in the new area was dominated by Ponderosa, tanks and open meadows. 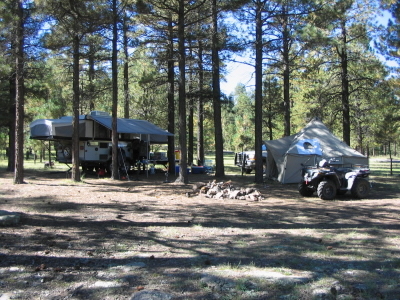 It fit our eye much better, we found a campsite, dropped off the 4-wheelers we were toting in the truck to �save� the location and made a quick trip back for the rest of camp. We made good time and found ourselves setting up our new camp as the sunset. Once the rumbling Ford 350 diesel was shut down, one thing became very apparent, screaming bulls, lots of them in every direction. That evening's bugle fest was the routine for the rest of our stay. Clear, calm nights with the full moon near, the bulls sang all night long and made for some of the most enjoyable sleepless nights I've ever experienced. We scouted from camp Friday morning, listening to the morning bugles and organized for our stay. A mid-day cruise on the ATVs provided our first sighting in the area. Taking a break on the top of a mesa, a bugle rang out close by. A 400 yard stalk, and we were able to glass a small 5x5 bugling from his bed with a couple cows browsing nearby. A bull that sounded much larger was screaming down the draw as we backed out to the quads. Friday evening, Hilg and I went our separate ways. 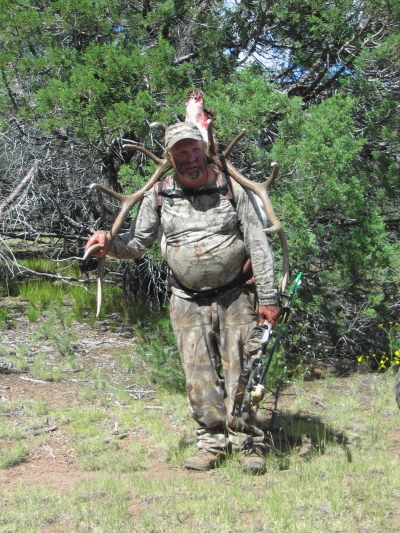 He went to an area that was dubbed the �Super Bench.� He filmed some small bulls and listened as two bulls that had enough of vocal challenges and met with clashing antlers to figure out who would be the boss. Monte and I went to an area I had picked out while researching in Nebraska. We saw some rubs that indicated �big bulls� and saw 4 rag horns and spikes. As we walked back to the quad at sundown, a bull was singing challenges to all that would listen. He was not far from where we parked and I ran up the road to get a look at him. What a bull he was, a main frame 7x7 that had to push 400�. I've never seen one like him on the hoof. He had 20-30 cows and a sattelite bull following his harem. With the wind perfect, I was preparing to get some video, when the sound of a rumbling truck coming up the road caught the attention of the elk. The truck drove past me and pushed the herd up a ridge out of my sight. I walked out all smiles and the bull went back to bugling challenges once the truck had moved past. I never saw that bull again, found plenty of rubs I assumed were his, trees stripped a foot or two above my out stretched hand. We weren't on a Colorado OTC hunt, felt more like elk hunting heaven. Saturday morning, more bugling bulls, I was in the area I saw the big boy and heard no bugles that I could identify as his. We made the trip to town to get a shower and watch the football game. The Huskers had a good game against Washington, had dinner and went back to camp. We stopped on the road near �Super Bench,� the bulls continued to scream and we decided to make it our first hunt the next morning. Up at 4:00a.m., and a quad trip to the �Super Bench,� we stalked closer to the bugling bulls in the darkness. We also noticed some other head lamps and hunters calling in the dark. Seems a few camps had moved into the area Saturday and located close enough that they could hear all the activity on the �Super Bench,� seemed like a good spot for them to hunt too. We pushed on, and at daybreak we were sprinting to keep up with a bull that was on the move. We caught up with him, had him very close, I estimated him to be less than 80 yards, but the dense cover in this area didn't allow us to get a visual of him. He moved on and we pursued him until he reached some property we could not hunt. Feeling safe in his sanctuary, he bugled his �see ya laters� over his shoulder and we headed back out. The morning hunt did not take us into the �Super Bench,� so we navigated there. We saw a rag horn on the way and reached the bench with the unmistakable sound of a quad coming. The operator didn't see us and parked a few hundred yards away. We talked to him, and he seemed to care less about being illegally off road, nor our irritation of it being in the center of the �Super Bench.� We took some pictures and way points and went back to camp. Monte had stayed in camp and took a morning walk. He suggested we take a cruise and look at some of the country very near camp that he saw on his walk. There was a nice tank, open grassy meadows, all round good elk country. Hilg planned to come back to the tank with a tree stand and spend the evening there. I went back to the area I saw big boy, hoping to find him again. My hunt took me to a secluded lake/wallow that I thought might hold a good bull. 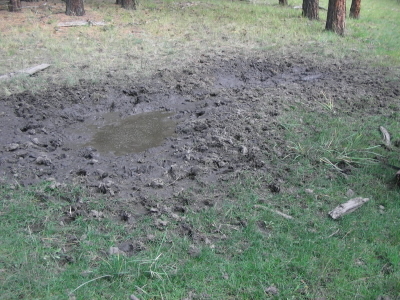 The wallow was freshly used before I got there, my only sighting was a lone spike. My trip back to camp got me there in the dark. No Monte to be found, wonder where he is at?? I stow my gear and open the camper door, a note falls to the ground, �Herb, come to the tank. OMG! 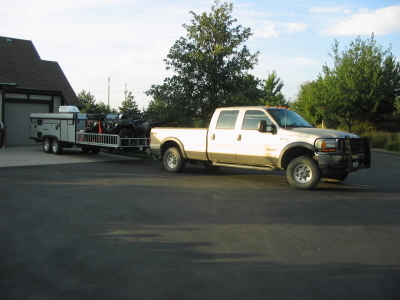 !� So that's what I did, jumped in the the truck and drove to the tank. Hilg left camp about 1:00 p.m. for a long sit on the water. He found a nice tree that allowed him to be shaded most of the day from the afternoon sun. He set up his Montana, �Miss September� cow elk decoy next to the water, settled in and read a book. About 4:00p.m. he heard his first bugle. He did some cow calls and went back to reading. Bugles became more frequent, he continued to call and read. About 6:00pm, one bull seems to have taken an interest in his calling and is getting closer. A bull below him begins to bugle and Hilg calls as if interested in him. His gamesmanship paid off, and the bull above him came quickly to not let this cow get away. The bull sounded small and Hilg planned to get some nice film of him. As the bull got closer, Hilg chose the bow over the camera, expecting him to come into view at any time. The bull crested the ridge above the tank and Hilg thought, �Whoa, Big Bull! !� The bull paused, then saw the decoy and trotted to the tank. 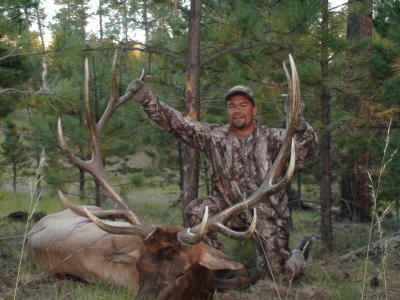 50 yards, 40 yards, 30 yards, �1, 2, 3, 4, 5, 6, 7, � the bull passed behind a large tree and Hilg comes to full draw. The bull steps out at 20 yards, �green pin, green pin� and the arrow is gone. The arrow passed thru and red blood poured out both sides. �1, 2, 3, 4, 5, 6, 7 on the other side too! !� The bull stops and goes down in 40 yards, done. The bull was only 20 yards off the road, we back the truck up to him, loaded the meat, cape and head and made the 1/4 mile trip back to camp to celebrate the evening events. With the meat cared for, the story got replayed many more times. Wednesday morning I was on my own as Hilg and Monte slept in. I dogged some bulls in the dark and soon had elk in view in the early morning light. They were on the move and I was rushing to keep up. They covered about 3 miles and were dropping into a drainage, when a lone bull came back to me. He bugled every hundred yards and continued to get closer. A nice 6x6 with big fish tails, plenty good for me. He passed into a shooting lane and my arrow left the bow. The arrow clipped a tree branch and sailed well clear of the bull. He didn't leave quickly, and I nearly got another shot, but he had seen enough and moved on. The hunt was done.